I watched the Netflix version of House of Cards for four seasons. I gave up on it early in the fifth season because the plot twists had become too bizarre — even more bizarre than having vice-president presumptive Frank Underwood (Kevin Spacey) push Zoe Barnes (Kate Mara) under a D.C. Metrorail train early in the second season. Evidently, a lot of viewers didn’t share my disenchantment with the series. 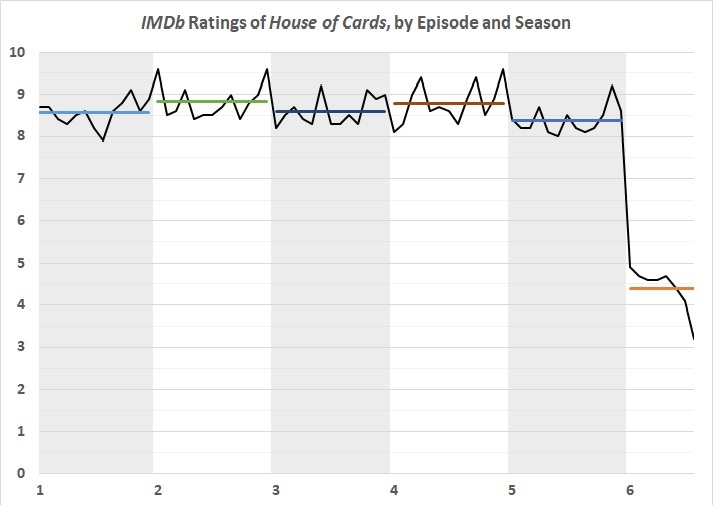 The ratings assigned by Internet Movie Database (IMDb) users held up through the end of the fifth season. And the average ratings for that season are only a touch below the ratings for earlier seasons. Frank/Kevin has the last laugh. Actually, it would be the first laugh for House of Cards, a somber though often gripping fantasy. This entry was posted in Culture - Language - The Arts and tagged House of Cards, Kevin Spacey. Bookmark the permalink.